Which of the following social media sites, if any, have you accessed in the last month? This statistic displays the top social media sites among respondents in Great Britain in 2013. 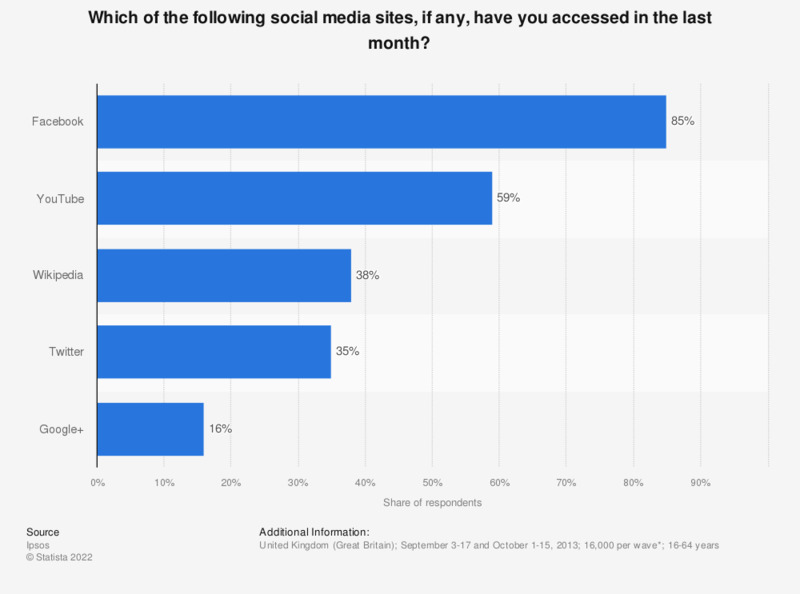 As of fall 2013, 85 percent of respondents in Great Britain reported accessing Facebook in the past month, while 35 percent accessed Twitter. * Research was carried out in two waves. The source indicates the survey was conducted with questions put to a total sample of 16,039 adults across 20 countries in September 2013 or to a sample of 16,167 adults in October 2013. Approximately 1000+ individuals were surveyed in Australia, Brazil, Canada, China, France, Germany, India, Italy, Japan, Spain, Great Britain and the United States of America, and approximately 500+ individuals were surveyed in Argentina, Belgium, Poland, Russia, Saudi Arabia, South Korea, Sweden and Turkey. Data has been weighted to the known national populations. Where results do not sum to 100, this may be due to computer rounding, multiple responses or the exclusion of don't knows or not stated responses.